We’d love your help. Let us know what’s wrong with this preview of Bella Donna Coven Road by Ruth Symes. Ever since she was a baby, Bella Donna has suspected she has magical powers, and she wants nothing more than to be a witch. Bella lives in an orphanage, waiting for her “Forever Family,” until one day she meets Lilith Sorciere and agrees to move in with Lilith and her niece Verity. Bella tries keeping her witchy tendencies a secret from her new foster family, and she stays Ever since she was a baby, Bella Donna has suspected she has magical powers, and she wants nothing more than to be a witch. Bella lives in an orphanage, waiting for her “Forever Family,” until one day she meets Lilith Sorciere and agrees to move in with Lilith and her niece Verity. Bella tries keeping her witchy tendencies a secret from her new foster family, and she stays on her best behavior—but when she comes home early one day from school, she stumbles upon something very surprising! Could Coven Road really be a road for witches? This first installment of the sweet, spooky Bella Donna series will captivate young magic-loving readers. Bella Donna: Coven Road is an engaging and entertaining read with a subtle message to be yourself. Marion Lindsay’s adorably simple spot illustrations bring even more magic to author Ruth Symes’s delightful tale. 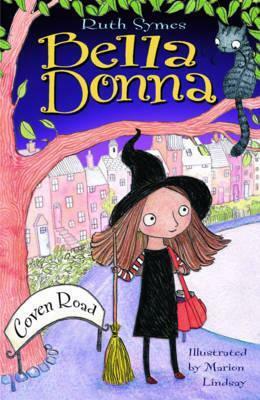 Fall in love with Bella Donna and her road to witchdom! And be prepared for her next big adventure! To ask other readers questions about Bella Donna Coven Road, please sign up. Isabella lebt im Kinderheim, wartet auf ihre "für-immer-Familie" und möchte unbedingt eine Hexe sein. Daher passt sie so gar nicht zu den anderen Mädchen in ihrer Klasse, denn mit Rosa kann Bella überhaupt nichts anfangen. Die Geschichte ist sehr niedlich erzählt und hat mit Isabella mal eine etwas andere Protagonistin. Ich fand sie war ein klasse Mädchen, dass immer für ihren besten Freund Sam da ist. Ich habe die beiden wirklich in mein Herz geschlossen. Auch die Hexenwelt wurde sehr einfallsrei Isabella lebt im Kinderheim, wartet auf ihre "für-immer-Familie" und möchte unbedingt eine Hexe sein. Daher passt sie so gar nicht zu den anderen Mädchen in ihrer Klasse, denn mit Rosa kann Bella überhaupt nichts anfangen. Auch die Hexenwelt wurde sehr einfallsreich und kreativ beschrieben. Auch wenn man schon so einige Hexengeschichten kennt, war hier noch so einiges Neues dabei. Die Illustrationen waren sehr schön gestaltet, lediglich die Menschen waren nicht ganz so nach meinem Geschmack gezeichnet. This book was so good that I want to go buy the rest of the series Right Now. In this book Bella Donna gets adopted. My favorite part is when she stops trying to be a normal girl and lets herself be a witch. Fun, quick read narrated by the title character. Bella and her friend Sam are both looking for their "Forever" homes. They have grown up together and both have quirks that make it harder for them to be adopted. Bella wants to be a witch - she is not supposed to voice aloud to prospective parents, and Sam loves bugs and reptiles and getting muddy. "Trying to be perfect had turned me from unpopular into popular and it was a lot easier being popular. I liked people liking me. I liked wearing pink." Go Fun, quick read narrated by the title character. Yetimhanede büyüyen bir çocuğun cadı olma hayali üzerine sıcacık bir hikaye. I would give this book 5 stars because the main character, Bella Donna, and I share the same best day of the week, Friday! It's also fantastic because there is a series with 5 books in it ,so if you like it you can read the next book but or course you don't have to read the next book if you don't want to. Coven Road follows the story of a little girls life, Bella Donna. Bella Donna was a normal child who lived in an orphanage and who wanted to be a witch. Bella Donna was adopted by Lilith who, it turns out, is actually a witch! Bella Donna doesn't know that Lilith is a witch to begin with until one day when Bella Donna comes home early because of a storm she discovers Lilith's secret. Bella Donna was amazed, she was lost for words when she saw the things Lilith could do. Now she wanted to be a with even more. With Lilith's help Bella Donna learns how to become a witch and finds out about the secret lives of witches. Eventually, after lots of hard work, Bella Donna is ready to be a real witch and there is a ceremony declaring her a 'Witchling'. I would love to be Bella in this book. Her life sounds wonderful and mysterious. The moral of this story is that if you really want to be something you can if you try hard enough. I would recommend this book to girls aged 7-10 who enjoy fantasy. The book is 180 pages long but you should read it slowly so that you don't miss any important bits. I gave the audio book of the first four Bella Donna books to my daughter (aged nearly six) to listen to on a road trip. She became so entranced that she was completely antisocial all weekend and remained plugged in to her headphones at every opportunity. She rates it, "The best audio book ever!" She then insisted that everyone else listened to it too. Her sister (nearly nine) rated it as, "Surprisingly good and not just a little kid book. It reminds me of Harry Potter." I had to read it next. Al I gave the audio book of the first four Bella Donna books to my daughter (aged nearly six) to listen to on a road trip. She became so entranced that she was completely antisocial all weekend and remained plugged in to her headphones at every opportunity. She rates it, "The best audio book ever!" She then insisted that everyone else listened to it too. Her sister (nearly nine) rated it as, "Surprisingly good and not just a little kid book. It reminds me of Harry Potter." I had to read it next. All the books in the series are short, insubstantial and not recommended for adult readers but a great read for younger children and even reluctant readers in the older primary age group, as the protagonist is 10-11. This story reminds me a lot of Meet The Robinsons. Two little friends trying their best to find their forever family. Both children have things that make them very special and they need just the right fit. Bella Donna wants to be a witch. Sam needs a family that loves mud and frogs. In this story Bella Donna finds a home first. She is afraid to be herself though, and tries her best to fit in and act like everyone else.She soon finds out that her new mom is just like her. Mwanwhile Sam thinks he has This story reminds me a lot of Meet The Robinsons. Two little friends trying their best to find their forever family. Both children have things that make them very special and they need just the right fit. Mwanwhile Sam thinks he has found his forever family, and then something goes very wrong. Then a lot like Meet The Robinsons, everything gets much worse. It doesn't take a time machine to fix things, but a special kind of magic to set things straight. Ich brauchte mal was zum abschalten. Bella Donner ist eine nette Geschichte. Einzig der Name der Katze "Pegatha" hat mich immer an das Wort "Pegida" erinnert. Mann dieses Wort verpestet mein Gehirn.